The SR Smith Turbo Twister swimming pool slide is one of the popular SR Smith slides at 8 Foot high for residential purposes. 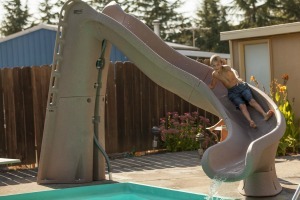 The slide is great for both children and adults and have a maximum weight capacity of 275 lbs. It’s available in both right or left curves and you can choose from 2 different colors: sandstone or gray granite. The Turbo Twister slide offers as much fun and excitement as any commercial slides — except that this one can be installed right in your very own backyard. Choose from a flume that curves left or right. 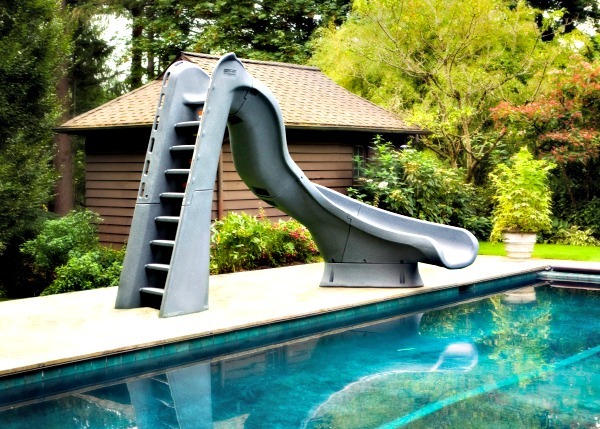 At 8 feet high, this is one of the popular swimming pool slides for inground pools. It has a long curvy flume which measures 14 feet and 4 inches long and 23 inches wide. It’s also deep enough so that it has enough support and protection for the person going down the runway. 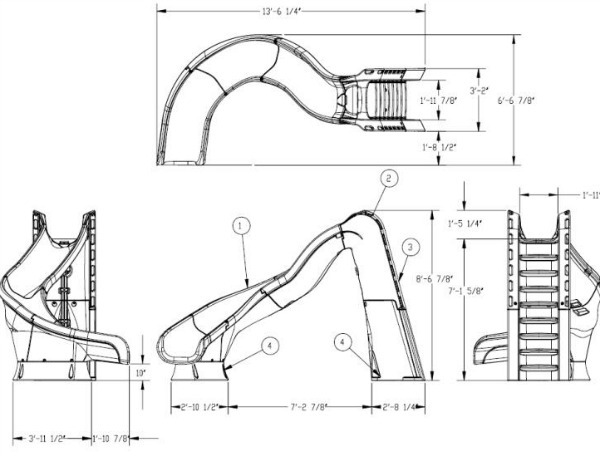 Here’s a diagram of the S R Smith Turbo Twister Slide dimensions. This image shows how big the slide is and the required space needed to properly install it on your pool deck. 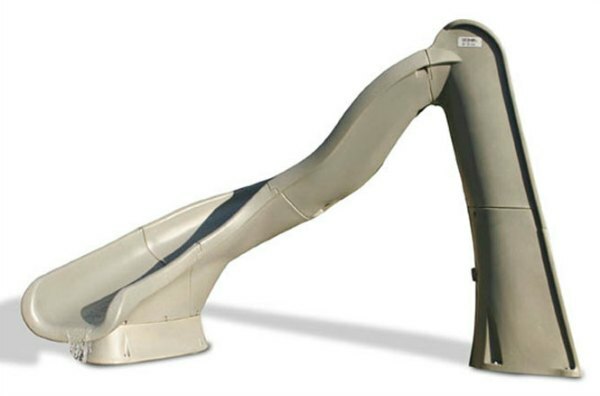 As of time of writing, the Turbo Twister pool Slide has a recommended sale price of $3,599. However, you can find it at even greater prices in one of our ad sponsors below. Check them all out as they offer different sale prices and oftentime, free shipping depending on the season. The Sr Smith Turbo twister slide was made for easy home installation. It is said to be one of the fastest and easiest slide to assemble outdoors. The manufacturer recommends having at least 2 persons install it. This way, the installation can be easily done in an hour or less. All packages arrive at your house complete with all the necessary hardware needed to prop this up. It has the parts of the slide as well as the bolts needed to durably and firmly mount it into your deck. No anchors are needed to get this standing and working. Since this is one of the popular inground pool slides, it’s quite easy to find videos and reviews online. Here are some videos showing some happy people when they got their turbo Twister slide at home. Some good videos for you to see it in action plus some promotional videos too so you’ll see some of the great features. And here is Amerimercs promotional video of the Sr Smith Turbo Twister Swimming pool slide. This one gives you a good insight into the ladder and the hand rail and how you could go up it. If the SR Smith isn’t exactly what you’ve been looking for, check out other swimming pool slides featured in this site.